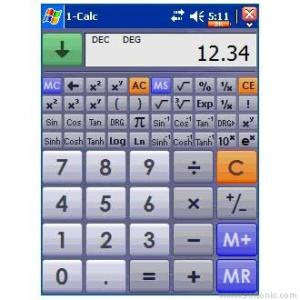 1-Calc is a revolutionary new calculator for the Pocket PC. It uses big buttons you can easily hit with your finger. The buttons provide clear audible & visual feedback of being pressed. It has been designed to be your "everyday" calculator that you can quickly pick up & use for a few basic calculations. * Easy enough to use every day. * Currency converter with auto rate grab. * Financial & Stats, Graphing calculator. * Unit converter, Tip Calculator. * RPN, DAL & Algebraic calculator modes. * 5 memory banks with copy/paste.